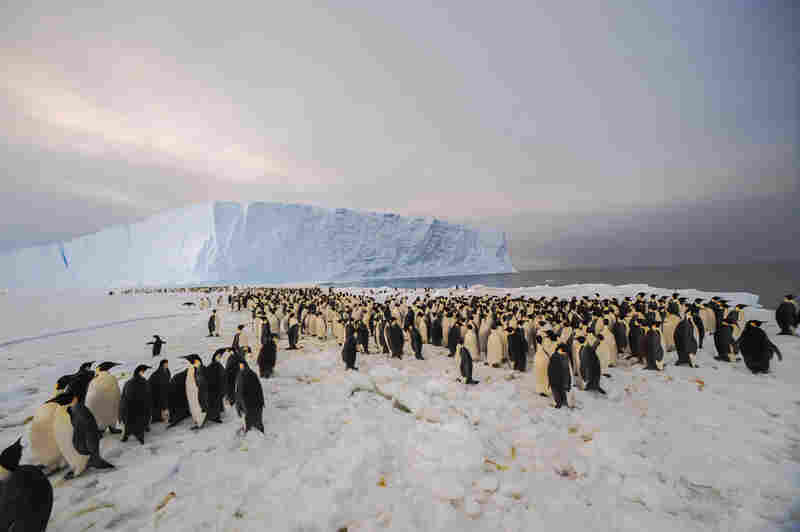 Penguin Poop Leads Ice Researchers To Unknown Colony A team of researchers from the British Antarctic Survey stumbled upon some interesting satellite images in 2009: a trail of penguin poop that showed signs of a huge colony of emperor penguins. A team of researchers finally made it out to visit the 9,000-strong colony last December, marking the first human contact the animals had experienced. The colony of emperor penguins was first discovered in satellite imagery by scientists from the British Antarctic Survey in 2009. Adults and chicks at the newly discovered emperor penguin colony. The animals had never had human contact. Expedition leader Alain Hubert was one of the first to visit the colony. 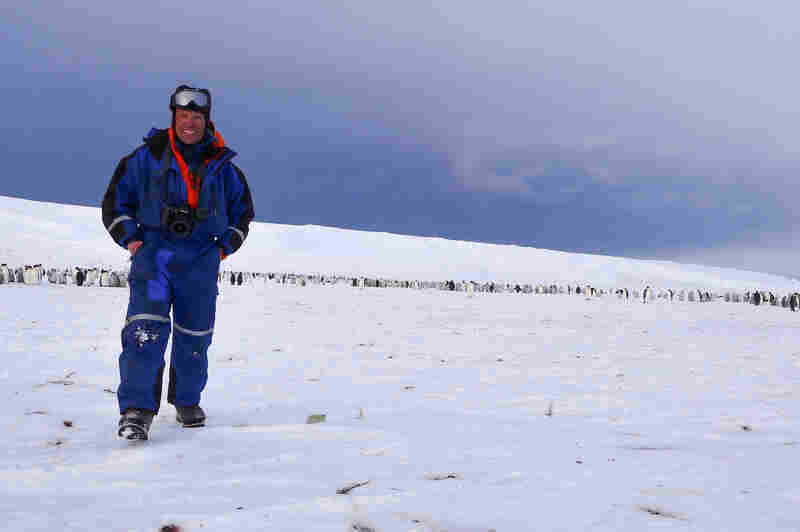 Hubert and two other researchers traveled 30 miles to find the penguins. The colony lives on Antarctica's Princess Ragnhild Coast. 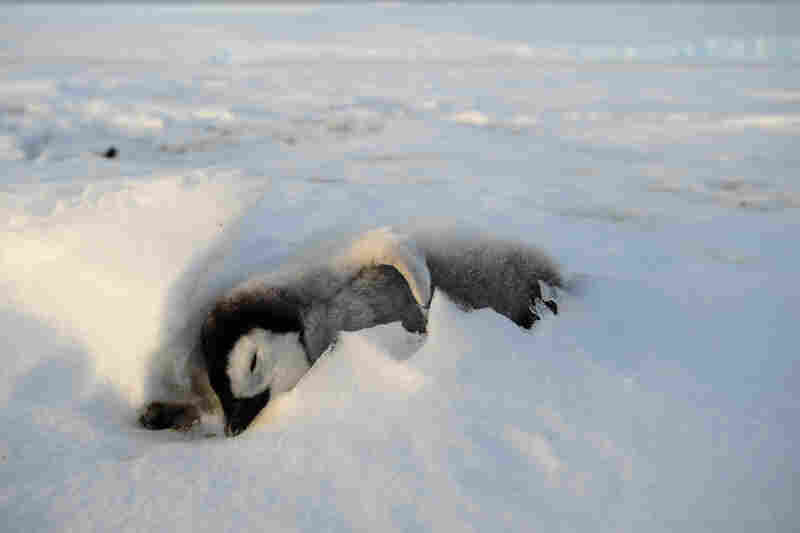 The team found one penguin chick that didn't make it. 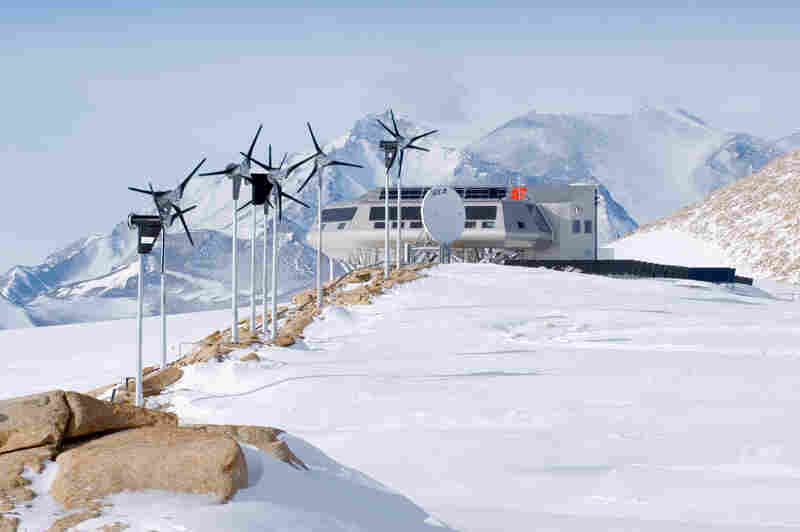 The Princess Elisabeth research station is the world's first zero emission polar research station. In 2009, a team of researchers from the British Antarctic Survey were studying satellite images of the Antarctic when they noticed something interesting: trails of penguin poop. That showed signs of a huge emperor penguin colony. 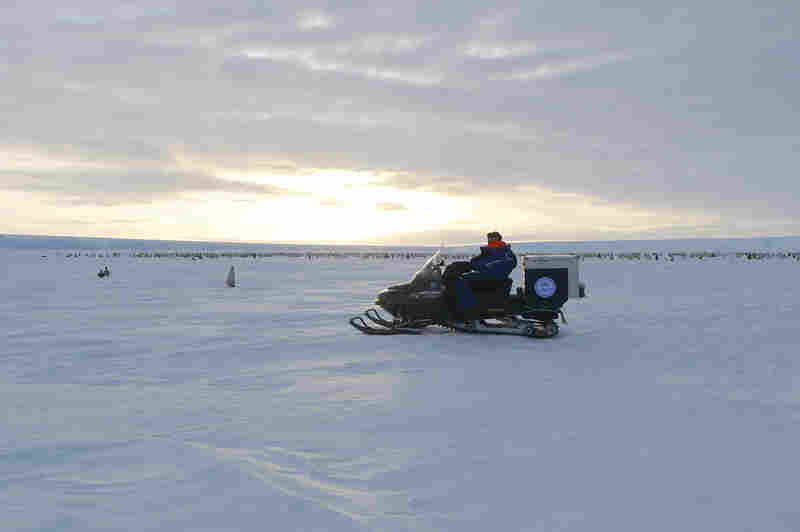 The existence of the colony was unconfirmed until a team of researchers from the International Polar Foundation visited in December 2012. 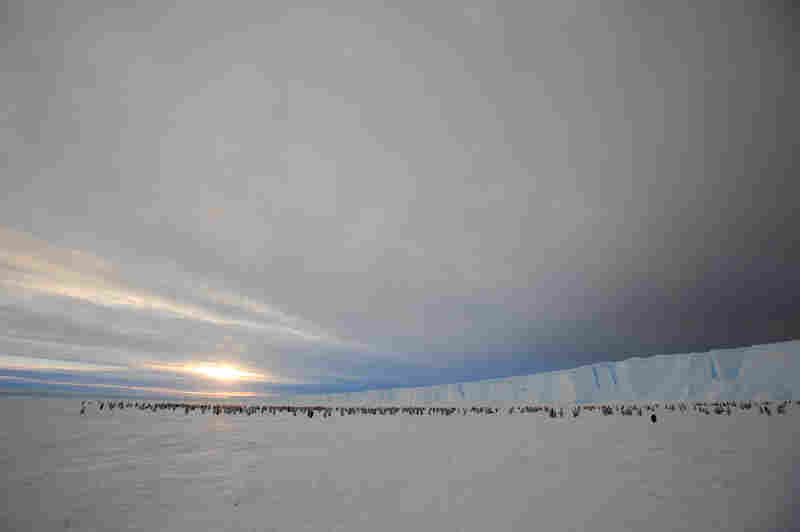 Alain Hubert, founder of the International Polar Foundation, was one of three researchers from the foundation's Princess Elisabeth Antarctica polar research station to visit the 9,000-strong colony of penguins on Antarctica's Princess Ragnhild Coast. "When you arrive, they just come to see you, to watch you, to turn around you," he tells NPR's Neal Conan. "The penguins — and especially the emperors — they are so human. They're so cute." Since the penguins had never encountered humans, Hubert says they weren't scared, just curious. Hubert and his team live at the research station during the Antarctic summer and are focused on studying climate change, not penguins. 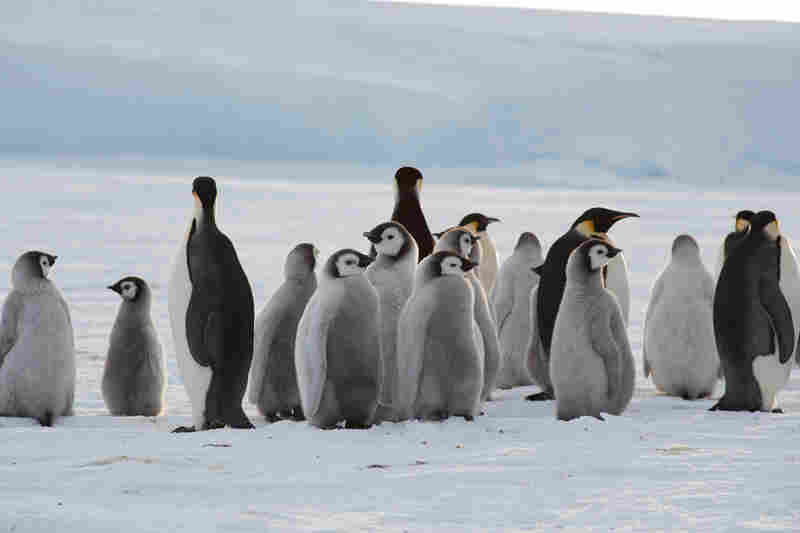 After they encountered a number of emperor penguins, they were convinced that a colony must be close by. They decided to make the treacherous 30-mile trip east to the sea ice. "First of all, you have to imagine you're in the middle of nowhere — without any visibility, with complete whiteout after 24 hours driving on the ice — you go down to the sea." After navigating their way to the sea, they searched for hours and found more penguins than they had ever imagined. Hubert says that seeing so many animals huddled together was like being on another planet. "I spent more than five years of my life in the polar regions, but that was the kind of moment that I wouldn't have expect[ed] to be able to ... just enjoy," Hubert says. "It's a privilege." If there was enough penguin poop to see from space, it seems like there would be quite a stench on the ground. Hubert says it wasn't a problem. "It's too cold, really, to smell it, you know?" Hubert says. "I spoke to some scientists ... and they told me if it was a bit warmer, it's really smelly."